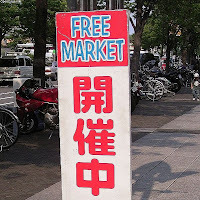 In Japan, flea markets are often mistakenly called "Free Markets". Earlier this month, Aki and I brought a bunch of our old clothes and other misc. items to our local flea market (at Maronie). We were all set up by 9am and that's when a flood of people started coming. IMHO (In My Humble Opinion), we had the best stuff there and also the cheapest. Aki was selling her DKNY dresses for a couple of bucks. I sold some never worn (with tags still on it) Gap t-shirts for 200 yen. 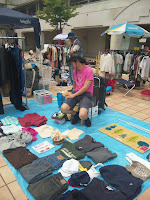 By noon, we had sold about 20,000 yen ($200) worth of clothes and other "junk". It was a fun day and we didn't do too bad for just a few hours "work" on a sunny Saturday afternoon. Flea markets are quite popular here as they don't have garage sales like we do in the states. Temples or shrines are a popular place to have flea markets and they usually start very early in the morning. If you haven't gone to a flea market yet, you should. There's something for everyone. Remember the old saying, "One man's junk is another man's treasure".